There has been an increasing shift toward professionals working remotely lately, with more than 70% of the workforce working outside of the office at least once a week. On top of this, around 3.9 million Americans now work from home for at least half of their working week. Many people choose to work from home in an attempt to achieve the perfect home life/work balance. If you are one of those statistics or wish to pursue a career that allows you to work full-time from the comfort of your own home, it would be wise to set up a home office. A home office allows you to create a dedicated workspace that can also be shut away outside of office hours. Here are a few things to keep in mind to utilize the space to its full potential. Obviously, a PC or laptop will be first on your list. However, don’t be tempted to go for the cheapest option in a bid to save money. Consider the different ways in which you’ll need to use your computer, as some tasks will require more memory, better graphics, or extra storage. If your job entails working on-the-go at times, a laptop would be your best bet. However, bear in mind that a cheaper laptop will need replacing far sooner than if you were to spend a little extra on an upgrade. Once you’ve purchased a computer, remember that you’ll need to install the relevant software, such as Microsoft Word or Adobe Photoshop, so factor those costs into your budget as well. Other equipment you may need include a telephone, a printer and/or scanner, a backup drive, a shredder, and lockable storage. If you’re fortunate enough to have a whole room dedicated to your home office space, you’ll need to think carefully about the design. If you leave the walls as they are, you run the risk of having a look that is too casual, which can impact on your productivity levels. There needs to be a clear distinction between the look of your home and the look and feel of the office. It might be necessary to completely redecorate before you set up shop. Certain colors that work well in bedrooms and living rooms will not work well in a working environment. For example, blue is perfect for a master bedroom, as it can help to lull a person to sleep; this is obviously not a wise choice for your office. Go for subtle versions of yellows, reds, purples, or greens. Green is great for concentration, and purple is good for the imagination. To fill any empty space on the wall, hang items that have a use or meaning. 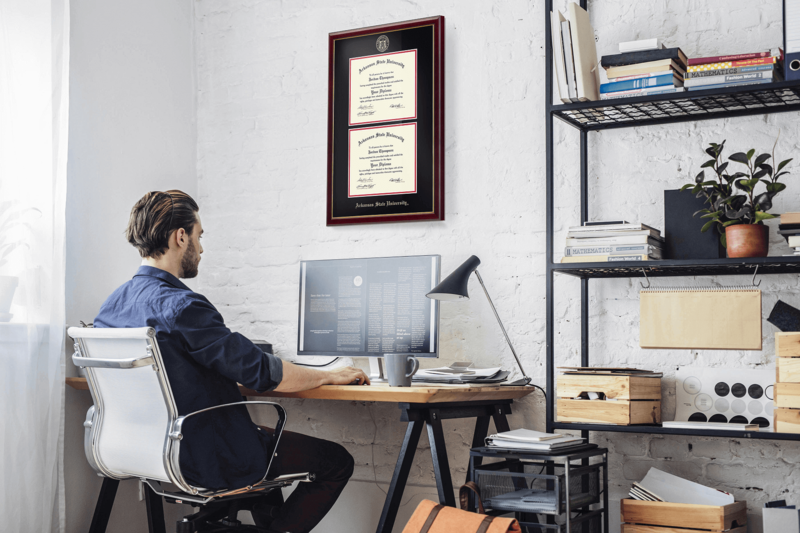 For example, dig out any certificates, licenses, or diplomas related to your occupation and hang them proudly in a personalized frame from a handcrafted framing company such as Church Hill Classics. These documents represent hours of hard work and sacrifice, so surrounding yourself with reminders of how far you’ve come is great for productivity. Alongside these framed certificates, you’ll need a calendar and possibly a bulletin board. You will be spending a great deal of time in your office if you intend on working full-time, so make sure you focus on comfort and ergonomic furniture. An employer would need to consider your health, safety, and welfare, and you should too. Make sure you choose a desk chair that that supports your back and has enough cushioning for you to sit comfortably for as long as you need to. Consider investing in a standing desk or, even better, an adjustable desk that lets you alternate between standing and sitting. When setting up your computer, you’ll need to adjust the height so that the top of the screen is at eye level. Your desk chair will need to be at the correct height so that your feet can rest firmly on the floor. You will also need to consider extras such as footrests, wrist supports, and a specially designed keyboard and mouse that will reduce any strain when typing. Obviously, you will need to consider lighting when setting up your home office—the more natural light you have, the better. Try to position your desk near a window; ideally, have the window to the side of you. If you have your back to the window, it will reflect on your screen and strain your eyes. If there is not much natural light in your chosen room, use task lighting. To avoid screen glare, make sure the light source is not directly above your workstation. For a finishing touch, try to include some houseplants. It’s been said that having plants in a work environment increases productivity by as much as 15%. If you have the space to create your own home office, grab the opportunity and keep these tips in mind!